It’s my first day back at work after the Easter holidays and my stomach is growling away at me. Either it’s punishing me for overloading it with chocolate or it’s demanding more. (Speaking of chocolate, travellinginmybookcase has set me a chocolatey-book-related challenge that I will get on with very soon!) 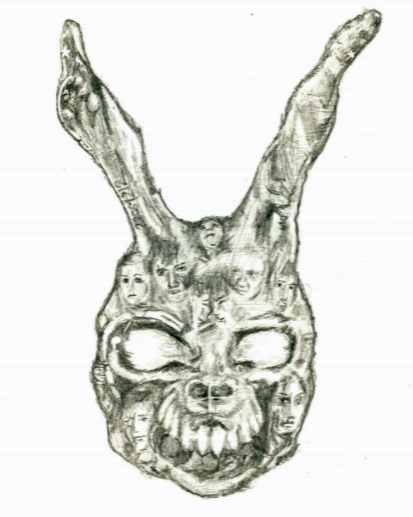 For now, here’s a sketch of Frank the Rabbit from the film Donnie Darko. Because bunnies! This was taken from the poster art rather than the mask itself. As you can see, it’s composed of various faces and iconic images from the film so it was fun to go through and try to spot what each one was. I’ve seen both the theatrical and director’s cut multiple times and I still make a new connection or come up with a new idea every time I watch. Likewise, I was just compelled to draw this… I guess you could say, they made me do it.